Sony’s PlayStation network on PlayStation Vita, PlayStation 3 and PlayStation 4 are down and the irritating fact for gamers is that the company has not given any time frame when the service will be back online. 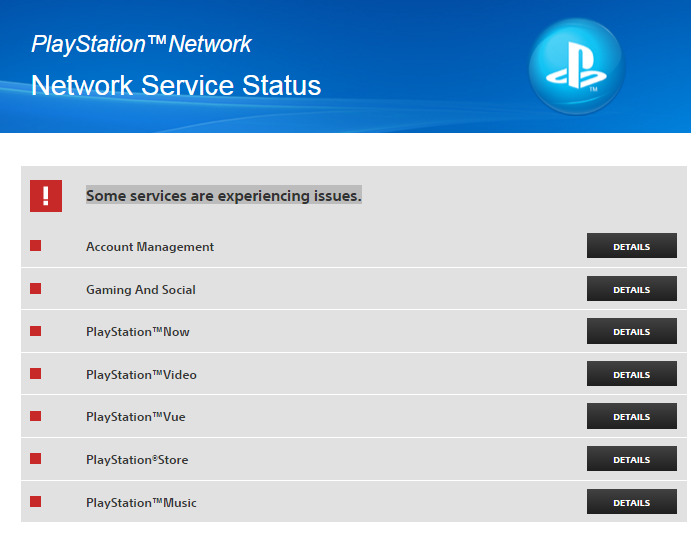 The PlayStation Network is down worldwide. I’m just back home trying to play with my son when I had the ugly surprise. It is the first massive outage of the year, I searched for information on the Internet and I have found that all the users are suffering the same problem. Like many other users, I’m receiving an error message saying that the PSN is currently “undergoing maintenance”. The PlayStation Network online service allows users to access online features of many games and to the official store. Sony confirmed that the network was “experiencing issues” and its status page showed that the problems were affecting all of its major services, the company hasn’t provided further details on the problem. Play Station Network also suffered technical issues over the Christmas period, some users reported difficulties in authenticating the online services. Last year hackers belonging to the hacking group of the Lizard Squad took down at Christmas the online networks of both Microsoft Xbox Live and PlayStation network (PSN) highlighting security issues affecting the services of Sony and Microsoft. This year another group known as Phantom Squad announced its intention to ruin Christmas for gamers. Phantom Squad also said that both platforms are vulnerable to attacks, and they add that they were able to take down Xbox live during the weekend. At the time I was writing, the Sony’s “Network Service Status” confirmed the problems suffered by users accessing the Sony platform. The Sony Play Station network is down, including the PlayStation 3 and 4 and web services. It is unclear what caused the outage worldwide nor any hacking group has accepted responsibility for targeting the PlayStation network with their usual DDoS attacks. However, one Twitter user shared an Interesting DDoS map showing cyber attacks on the US from Chinese side (That doesn’t mean there was an attack on PlayStation network by Chinese hackers).